Email customer credit report. Follow steps 3 and 4 to locate all repositories with dispute. Go to credit report. On account where dispute shows up, click on link (XP/TU/EF) (under PAID) to see individual 3 repositories. Below is what 3 individual repositories look like under Original Tradelines for creditor above. There can be up to 3 disputes noted, or 1 for each repository. Check each under Remarks for the word Dispute, Disputed or Disputes. Whatever Bureau the Dispute is noted for may need be deleted from credit report. Important Note: Experian and Equifax below show Dispute in remark. TransUnion does not. Borrower only needs to request Dispute be deleted from Experian and Equifax. Call the Creditor (Vanderblt Mortgage, ph# listed on credit report). Tell them you no longer want to dispute validity of the debt & to remove the comment. Tell them you are in the process of a mortgage and clarify that this will be done in 72 hours. Ask that the dispute be deleted and request a letter from the creditor to confirm. Consumer calls each bureau back after 72 hours and confirm the disputed verbiage from contacted bureaus have been removed. Then, your housing counselor, loan originator or lender can re-pull a new tri-merged credit report. Through your HCA or lender that credit report received from, re-pull credit 48 hours after dispute removal requested. Below is a generic dispute removal request letter if your credit bureau must do a Rapid Rescore. There is a cost for this. Provide the letter shown below noting each account that dispute shows up on credit report for and the account#. Even if the dispute is noted under 1 to 3 of the repositories (EF/TU/XP), only list the account once with the account # on this letter. (Experian and Equifax only in example above.) Loan Officer/Processor must sign. Loan officer must pay for if file in process. I/We are writing to request the term “account information disputed by consumer” and/or “consumer disputes this account information” be removed from my/our account(s)/credit report(s). I/We had previously disputed erroneous information that was reporting, but the above creditor(s) has since corrected this information, therefore, I/we no longer dispute the information being reported. I/We have requested that each creditor update this with the bureaus. I/We are requesting that it be removed as soon as possible, as I/we are no longer disputing this account or its status. For years, we have grappled with a credit problem where past short-sellers who attempt to get approved for a conventional Fannie Mae or Freddie Mac mortgage are turned down because their short sale is credit coded as a foreclosure. This problem is commonly found during the mortgage process of a live contract where a deadline must be met. Often, options to get this corrected quickly are expensive or result in the borrower resorting to an FHA mortgage or a non-QM portfolio loan at a higher interest rate. When this problem was discussed with colleagues in the housing counseling industry, it became evident that this is where a solution to this problem for all parties might be. Why? Loan originators are trained to meet contract dates and get data needed to ensure an approval. Housing counselors are trained to analyze and prepare clients for homeownership. The credit code problem specific to short sales is not a singular issue. It starts with the realization that the short sale code is showing up as a foreclosure – something not visible until it is seen in both Fannie Mae and Freddie Mac automated underwriting systems. This doesn’t mean Fannie Mae and Freddie Mac are to blame for this problem – it’s just where it is first seen. Unfortunately, for many affected past short-sellers they learn of this problem on their first attempt to get a new conventional mortgage when they are eligible again four years after the short sale. But too often, lenders don’t run these clients through the automated underwriting system upfront which would allow the lender to know there’s a problem right away. And consumers don’t always let the lender know they had a past short sale. Note to all loan originators: ask your clients if they had a short sale up front! If they did, run them through your automated system immediately! Calls for help often come in when the loan is in crisis. Lenders are instructed on how to do the Fannie Mae Desktop workaround, but if the lender is primarily a Freddie Mac lender, there is no workaround. And because of slight differences in the popular Fannie Mae Home Ready program and the Freddie Mac Home Possible loan, calls for help are increasing for how to fix this problem in Freddie Mac. If past short-sellers know of the problematic credit code issue, they or a credit repair company attempt to get it corrected. The most common fix is to dispute the account. However, the dispute does nothing but hide the credit, offering a temporary fix that appears to work when credit scores increase. However, when the affected consumer applies for a new mortgage the dispute must be taken off of the credit. The previous credit code problem returns, credit scores plummet and if the consumer is in a contract, there is only one quick way to remedy the problem and that is with a Rapid Rescore. Per FCRA regulations, the lender must pay for the Rapid Rescore. Another problem that occurs is that because of the dispute, the “date reported” becomes more recent then the short sale closing date because of the new investigation. This date can’t be changed per credit reporting agencies and the automated systems can deny a past short seller if this date is within the four year wait limit. No lenders in the U.S. will do a manual underwrite to circumvent the problem, though both Fannie Mae and Freddie Mac have written criteria that allows for a manual underwrite. Last week, it was found that the same credit code problem appears to also affect those who had a modification and are over 120 days delinquent. It is a hunch that going over 120 days delinquent may be the key because an approval of a new loan was received for a consumer who was less than 120 days late on their mortgage prior to the short sale. Nonetheless, we are close to getting this resolved…. And the housing counseling industry will be involved in assisting in a permanent correction of this problem. The lack of housing affordability is rising among the 414 U.S. counties tracked by ATTOM Data Solutions. ATTOM, the new parent company of RealtyTrac, said on Thursday that 24 percent of those counties were less affordable than their historic averages in the third quarter of 2016, up from 22 percent in the second quarter and 19 percent a year earlier. It was the highest share for this metric since the third quarter of 2009 when 47 percent of markets had fallen below their historic affordability averages. 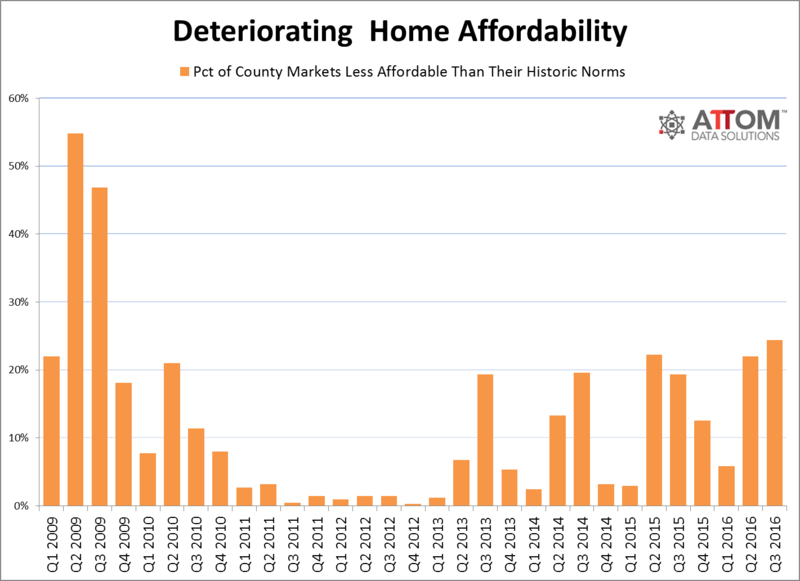 ATTOM reports that 101 of the 414 counties had an affordability index below 100 in the third quarter of 2016, meaning that buying a median-priced home in that county was less affordable than the historic average for that county going back to the first quarter of 2005. ATTOM’s affordability index is based on the percentage of average wages (taken from the U.S. Bureau of Labor Statistics) that is needed to make monthly house payments on a median priced home (as determined from publicly recorded sales deeds.) That payment is composed of principle, interest on a 30-year fixed rate mortgage with a 3 percent downpayment and including property taxes, and insurance. “The improving affordability trend we noted in our second quarter report reversed course in the third quarter as home price appreciation accelerated in the majority of markets and wage growth slowed in the majority of local markets as well as nationwide, where average weekly wages declined in the first quarter of this year following 13 consecutive quarters with year-over-year increases,” said Daren Blomquist, senior vice president at ATTOM Data Solutions. “This unhealthy combination resulted in worsening affordability in 63 percent of markets despite mortgage rates that are down 45 basis points from a year ago. Counties that were less affordable than their historic averages in Q3 included Harris County (Houston), Kings County (Brooklyn); Dallas County; Bexar County (San Antonio); and Alameda County in the San Francisco metro area. Counties still affordable by historic standards included Los Angeles County, Cook County (Chicago); Maricopa County (Phoenix); Miami-Dade County; and Queens County, New York. For past short sellers who have gone through the loss of a home and are eligible to return, criteria needed for a new mortgage is vague. The result is a partial story. Proving “extenuating circumstances” and confining the timeline for an economic event is a struggle for loan originators and underwriters trying to comply with vague criteria. Because of so many variables, lenders deny new loans for borrowers with a short sale or foreclosure in their past even when they may be eligible to repurchase again. We HAVE to get this right. Detailing WHY the loss of a home is the hardest thing for affected consumers to provide… not because they can’t remember, but because they relive it. In attempting to originate the FHA “Back to Work” loans, it would seem the process is simple. The criteria for “Back to Work” is to show a 20% reduction in income sustained for 6 months minimum that resulted from a loss of employment or reduction in income, which is considered the “economic event”. Here’s the bigger problem. Most who had an “economic event” tried to hang on, wiping out assets along the way. But, while trying to hang on, homeowners accumulated more debt to stay solvent and in most cases, to stay current on their mortgage. Then, another “economic event” hit, assets were gone and debt is so excessive that there is no choice but to short sell. As a mortgage broker in Florida where it is common to see Boomerang Buyers (those eligible to re-enter the housing market after a short sale or foreclosure), I often hear the full story for those who have lost a home and want to re-try home ownership again. An economic event followed by a prolonged period of trying to stay put, finally ended with another event where funds were no longer available and the only choice was to short sale, occurred in a great deal of these cases. Proof also exists to show a good number of these folks had excessive debt that pushed up debt to income ratios incredibly high prior to the sale of their underwater home. But, it gets confusing for a new mortgage. For the FHA “Back to Work” program, HUD approved counselors are able to determine hardship and can provide those who attempt a re-purchase one year after a short sale, foreclosure or bankruptcy with a housing counseling certificate. However, that doesn’t mean the mortgage company will approve the mortgage. Because the economic event may have occurred years ago and short sale processes took months or years, documentation such as tax returns and bank statements needed to show a lack of assets may stretch over the previous five to seven years rather than the most recent two years that lenders are accustomed to evaluating. Mortgage companies who offer FHA “Back to Work” are reluctant to promote this almost two year old program due to few of these loans getting approved. Part of this is because loan originators don’t provide enough documentation, and the other problem is that there seems to be wide discrepancy between underwriting opinion on these files. Varying opinion also exists for “extenuating circumstances” noted in Fannie Mae and Freddie Mac guidelines for eligibility of a new mortgage under four years. Underwriting interpretation of these guidelines vary greatly from lender to lender for the few mortgage companies who offer these loans. For loans submitted with what seems to be an iron clad “extenuating circumstance” or proof of the 20% reduction in income for 6 months minimum for FHA’s “Back to Work” program, underwriter opinion seems to vary widely. Some underwriters think the decision to short sale was too soon, while others wonder why homeowners waited. It seems they are trying to justify the sale was “not strategic”. The income, current credit and assets of borrowers who have gone through a short sale and are trying to re-enter the housing market is more than acceptable per current guidelines. They have to be next to perfect, and they know it. Other than knowledge of the past short sale, these are loans that any lender would want to have on their books. Those who make policy need to talk directly with affected past short sellers. They need to come to where underwater home problems still exist and see for themselves what is really happening. This can truly help the housing industry recover. Download/read the full report below. Fannie Mae Fix out Nov.16, 2013 and Two Fixes for Erroneous Foreclosure Code on Past Short Seller Credit Working Now! Effective Nov. 16, 2013, Fannie Mae “Fix”! During the weekend of Nov. 16, 2013, Fannie Mae will roll out automated underwriting changes to Desktop Originator/Desktop Underwriter to allow lenders to make a correction when past short sales are erroneously coded as a foreclosure. This will allow past short sellers now eligible for a new mortgage to obtain an approval through the Fannie Mae automated underwriting system (AUS)! Fannie Mae has been made aware that there are often inconsistencies in the credit data when Deed in Lieu (DIL) and Pre-Foreclosure Sale (PFS) events occur, and in an effort to assist borrowers in obtaining a new loan in an appropriate timeframe, DU will be updated to disregard the foreclosure information on the credit report when instructed to do so by the lender on the online loan application. a. The past short seller needs to have proof of past short sale available (commonly received from listing realtor) and a HUD 1 closing statement to show date of the short sale (both commonly retrieved from short sale realtor or title company). Provide to lender. b. Lender should run the Desktop Underwriter and get finding first. If Refer with Caution received (shown below), go back into 1003 loan application. When DU identifies a foreclosure on a credit report tradeline that appears to be one that was subject to a DIL or PFS, the lender may instruct DU to disregard the foreclosure information on the credit report by entering “Confirmed CR DIL” or “Confirmed CR PFS” in the Explanation field for question c. in the Declarations section of the online loan application and resubmitting the loan casefile to DU. When DU sees this indication, the foreclosure information on the credit report tradeline that also has a DIL or PFS Remarks Code will not be used. c. After the correction is made, lender should rerun Desktop Underwriter again. For questions regarding the support of this field by a lender’s loan origination system, lenders should contact their technical support team, and may also contact their Fannie Mae Account Team for additional assistance. FHA and VA loan approvals are not commonly resulting in loan denials for past short sellers through eitherFannie Mae DU or Freddie Mac LP systems. For short sales that are over 4 years ago, have your lender run through Freddie Mac LP automated underwriting system. Effective NOW: “Submit a Complaint” at CFPB.gov now. This prompts a response from your lender typically within 3 days. (A visual of the 5 steps to complete and a list of documents to have ready to attach is at http://closewithpam.com/directions-to-submit-a-complaint-to-the-consumer-financial-protection-bureau/). The resulting letter from your past short sale lender will have a CFPB case#. Effective NOW: Call your past short sale lender and ask for the “Executive Mortgage Complaint Escalation” phone number. Call this phone # and ask for a letter stating that your past mortgage closed as a short sale. a. Have your HUD-1 Closing Statement and the short sale approval letter(s) for the 1st (and 2nd ) mtg. ready upon this call. Make sure to ask how long it will take to get this letter. b. Forward the resulting letters from CFPB and your past short sale lender to your new mortgage lender and ask them to re-pull a new credit report. IMPORTANT: Ask your lender if they can pull credit through Kroll Factual Data or Acranet. I am having various results with different credit agencies and the greatest success has been with both of these agencies. c. Then, have your lender rerun your loan with the new credit report through Fannie Mae Desktop Underwriting. This results in an Approve/Eligible, or an Approve/Ineligible that can be fixed with proof of the short sale date. Video: Past Short Sellers Can Be Homeowners Again! George Albright, like many past short sellers, had a problem when he was eligible to repurchase a home. His past short sale credit was showing up as a foreclosure. George made this video to explain how he was able to get his credit corrected and buy a new home again. How many past short sellers, or those who may have to short sell, can this help? Simple instructions for past short sellers, realtors and lenders! Underwater Florida Residents: Be Prepared on 10/1 at 9am for $50,000 Principal Reduction through HHF! REPEAT: Underwater Florida Residents: Be Prepared on 10/1 at 9am for $50,000 Principal Reduction through Florida’s Hardest Hit Funds! Only 25,000 applications will be processed initially! And, on 9/23/13, this article on Hardest Hit Funds came out thanks to Beth Kassab in the Orlando Sentinel. However, this is what the Florida Hardest Hit Funds application page on their website showed: NO ABILITY TO MAKE APPLICATION until Tuesday, Oct. 1 at 9am! 2. Read Fact Sheet at http://www.principalreductionflhhf.org/rfv-77.aspx. 3. Check your income, per eligibility. Check your family income per Florida county. If you believe that you are over 125% underwater, are current on your mortgage payment and think that your income level will fall into eligible criteria, prepare to apply for up to $50,000 in principal reduction through the Florida Hardest Hit Fund on Tuesday, October 1st at 9am. Please make sure to review all criteria at http://www.principalreductionflhhf.org/.